You may have noticed at Motorcycle.com a relative lack of motocross coverage. 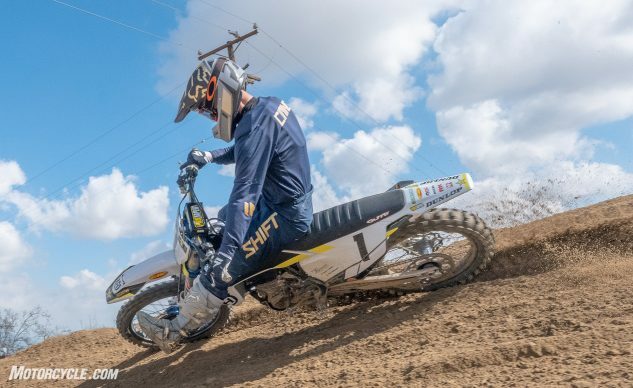 This isn’t because we don’t want to, but rather because none of the staff – except for Brent Jaswinski – feel they are qualified to really give MX machines a proper shake. The problem, of course, is Brent is (sadly) no longer a part of our crew. This posed an even bigger problem when Husqvarna reached out to us and asked if we’d be interested in throwing a leg over the 2019.5 FC450 Rockstar Edition. Our immediate answer was “of course” – now who do we get to ride the thing? Luckily for us, our pal Dominic Cimino answered the call and agreed to help us for his first review on the digital pages of MO. A lifelong dirt rider and former racer (who recently picked up his first street bike), Dom knows his way around a motocrosser and has done some testing for other publications in the past. He would have been happy testing nearly anything for us, but the fact we popped his cherry with the FC450 Rockstar Edition was just icing on the cake. Beyond the standard FC450, the homologation special Rockstar Edition sees parts inspired by Jason Anderson’s title-winning factory machine. Those include DID Dirt Star wheels laced to blue anodized hubs, new blue split-design triple clamps, FMF 4.1 exhaust, Pro Taper handlebars, Guts Racing seat cover, factory hole-shot device, and of course, the Rockstar Energy racing team graphics. Of course, there are more improvements to the engine, electronics, and suspension that you can’t see with the naked eye, all in an effort to get the power down smoothly and get you to the finish line faster than everyone else. For a more in-depth review, be sure to read the review in the link above and watch Dom flog it in the video here.